I’m a firm believer in not keeping items for best. It makes little sense to me to have a selection of clothes that are only worn on special occasions, especially when these are often the pieces that make us feel great. Why would anyone want to ration that?! If it’s the fear of them looking too worn, too quickly, then surely it’s a far bigger shame to have hardly worn them at all. And if it’s the thought that you might look over dressed, well, isn’t it far better to be over-dressed than under-dressed? I’m aware that some clothes are never going to be able to be dressed down, but for all the others that are I urge you; pull them out from the depths of your closet and let them shine. If you have a dress that you want to wear more casually, throw a leather jacket over it. If it’s a top, try it with jeans and flats. This lace top is proof that sometimes it only takes a small change to make a big difference. I love it when an outfit combines four of my favorite elements – black, lace, leather and leopard print, it’s what you might call a perfect Niki outfit. I’ve worn this on many a night out this winter, but that’s not down to the fact that it incorporates my favorite elements, it’s the vest. Pittsburgh winters can get so cold that I often need an extra layer when I’m inside bars and restaurants, and I’ve found this vest to provide the warmth I need without sacrificing style. This second look is proof that it’s possible to dress down, what might be considered, a smart top. 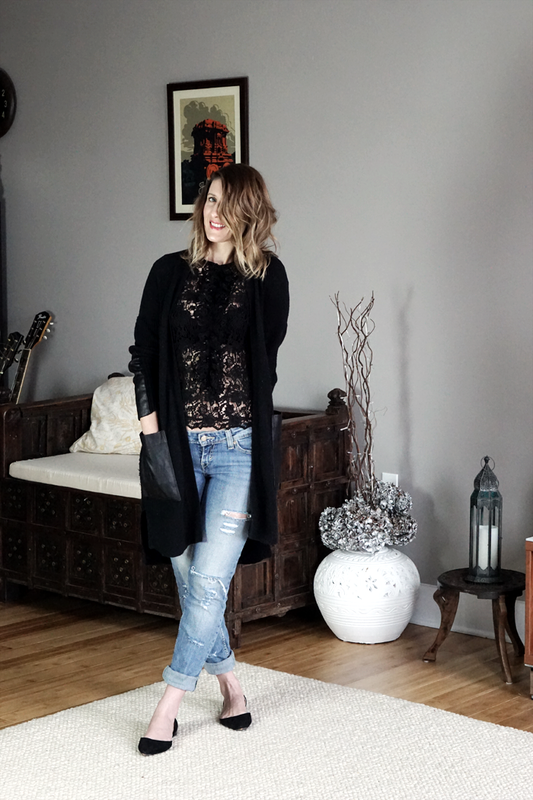 The lace is instantly more casual when teamed with ripped denim and flat pumps. I could probably have dressed it down a little more by wearing a black camisole underneath it, but I much prefer how it looks with just a black bra. In the summer I’ll wear this without the cardigan but for now, as it’s still a little chilly here in Pittsburgh, I’m wearing it with this long black cardigan which works perfectly as an extra layer without swamping the outfit. In this third look I am wearing a black camisole under the lace as, without it the lace and the floral print fight too much. I’ve tucked the top into the skirt to transform it from what would be an unflattering and bulky silhouette, to one that nips me in at the waste which is far more flattering. I love how this skirt transforms the top into something a little more feminine and fun. So tell me, do you keep clothes for best?